Everybody knows Michael Dell as the founder of Dell Computers, but did you know that he founded the company with only $1000 investment? Here is a short story about him with some other cool facts from his biography. Michael Dell was a smart kid. His parents wanted to make a doctor out of him, he even went to a college to study medicine. But this didn’t last for too long, just because he was passionate about computers since a very early age. So passionate, that he obtained and explored his first computing device when he was just 7, it was a simple calculator. At 15, he disassembled his first personal computer (Apple II), it was a present from his parents. They probably hoped that he would use it some other way… 🙂 and they were a little shocked to see it аpart. But this was for good because his passion for computers was the thing that made him found a company and sell computers assembled by himself. Michael started the business with only 1000 US dollars. A pretty nice investment, having in mind that Dell Computers is a multi-billion company nowadays. 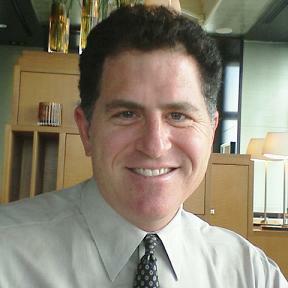 Today’s net worth of DELL’s CEO is estimated to be around $23,5 billion (2015). Not bad at all… He is the 42nd richest person in the world. – Michael made his first $1 000 selling post stamps, at the age of 12. – One summer, when he was still in high school, he started selling subscriptions to the Houston Post (this was a popular newspaper in Texas). The same year he made almost 20 thousand dollars from this business activity. – The first advertising campaign of Dell consisted of some advertisements placed on the back side of a pizza box. – In 1992, Michael was 27. The same year he became the youngest CEO whose company was in Fortune’s top 500 world companies list. – In 1999, Dell and his wife founded the “Michael and Susan Dell Foundation” with the main purpose to help the children living in poverty around the world. – Dell published a book in 1999 about his life, success, failures and the lessons he learned. You can see it here: “Direct from Dell: Strategies That Revolutionized an Industry ” – a great reading for every young entrepreneur. – Today M.Dell owns only 12% of the company he founded – “Dell Computers”. Hey, why don’t you share some social loving by using one of our social buttons on the site? Did you know that this way you can help us write many more cool articles like this one! Thanks!